Europe’s biggest direct Nest competitor is Tado, with its self-titled second-generation smart thermostat. Like the Nest its key features are smart learning and weather monitoring, but Tado takes this a step further. Not only does Tado track motion in the home, it also keeps an eye on all owners (those with the Tado app on their phones) outside the home. Consequently it can recognise when you are on your way back and adjust the heating to your ideal temperature as you walk in the door. It works brilliantly, but this so-called ‘comfort level’ can be switched off for those looking to save extra costs. The Tado also looks good. The second generation model adds an LED display to the thermostat, allowing adjustment without a smartphone or web browser. Meanwhile the smartphone apps and web layout are smart and intuitive. Sadly, for all its elegance, the Tado does have a separate internet bridge wired to your router and we found it doesn’t have the strongest signal. This means you may need to move your router closer to your thermostat if you live in a big house. Despite this the Tado performs extremely well and we saw similar savings to Nest of around 20%, which means it will quickly return your upfront investment. Tado is an impressive product. Its great advantage is that you can be as hands-on or hands-off as you like with your heating controls. I like the fact that I can turn the heating off by simply walking out the door. And the house is warm whenever I get home, without the need to heat the place all day or plan my arrival time. The app and online controls are easy to use and by heating my home more efficiently while taking into account the weather outside, it will save me money on my heating bill – although there is a question mark over exactly how much (see below). To work, Tado (just like your mobile phone company) has to know where you are at all times. But apart from a location you frequently visit, Tado says they only use information about a user’s current location. Data on your historical movements is not retained. The company claims savings of up to 31% from using the system versus a more conventional timed thermostat. With heating costs in the region of £600-£700 a year, that’s good money. But I’m sceptical that most homes would save as much as that. The numbers are based on a study commissioned and paid for by Tado and conducted by the Fraunhofer Institute for Building Physics (the company did not respond to my question about whether it was peer reviewed, but I suspect not). In it, the researchers compare the cost of heating properties with or without Tado: a five-room apartment with a single occupant and a house occupied by a family. They also take into account the difference between real weather and forecasted weather (for a reference year of 2004 in Munich). They did this as a computer simulation of how the different scenarios would impact on heating rather than using actual heating measurements from two real-life houses. The researchers conclude that presence detection alone can reduce heating requirements by up to 24% and adjustments by the system in response to the weather forecast give a further reduction of 7% (so 31% overall). Slightly puzzlingly, the researchers seem to assume that a five-room apartment needs less heating than a family home, but even leaving that aside, I think the study is much too kind to Tado. 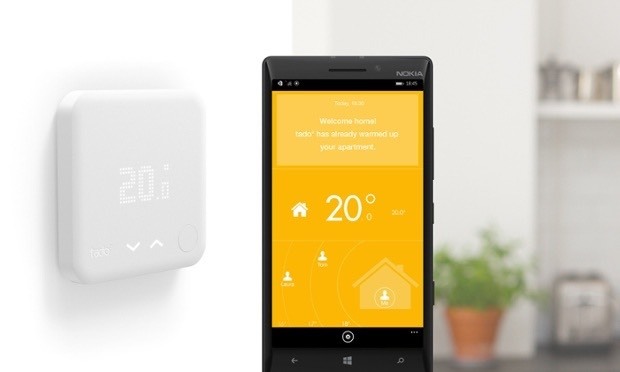 Firstly, it assumes the Tado system is set to a low comfort setting which is less energy intensive, so maximising the difference with the reference property on a standard heating system. But more importantly, it assumes that the property without Tado has the heating on all day at 20C. Because Tado is only heating the place when someone is there it brings in some impressive savings by turning off the heating for much of the day. As the study puts it: “The more frequently the users leave the home and the longer they are absent, the larger the system’s potential energy savings are”. In reality, I think most people would heat their home on a timer, for say, two hours in the morning and five hours in the evening, so the savings are not likely to be anywhere near as much. There is one other big downside. Tado is keen to point out on its website how easy Tado is to self-install. But installation was a big problem and is something the company needs to improve on. The system was not easy to install myself – alarmingly, the company’s patient technical support instructed me to partially taking the boiler apart to wire the Tado box into it, which I imagine is not something most people would be terribly comfortable about. Opting to have it done professionally costs £90 and took far too long in my experience (nearly seven weeks).